Believe Dream Create with Maria: My Pink Stamper Pinkalicious Blog Hop--January 2012! 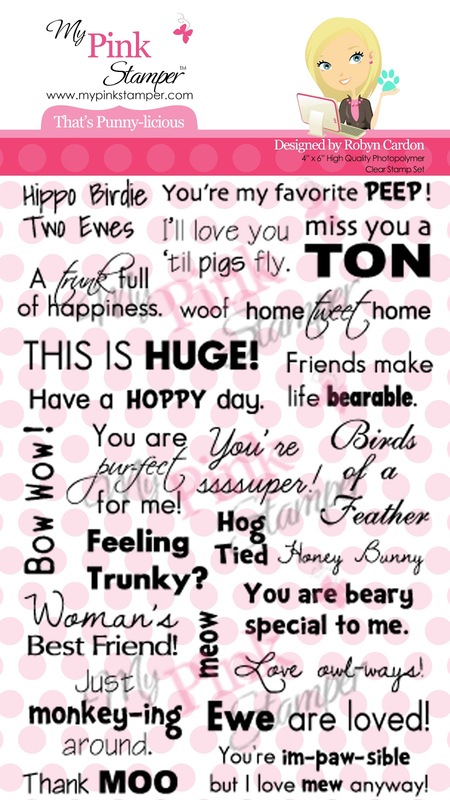 My Pink Stamper Pinkalicious Blog Hop--January 2012! 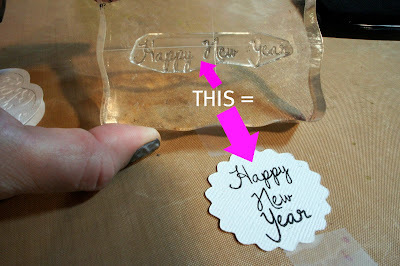 Welcome to the first My Pink Stamper Blog Hop of 2012! If you have arrived from my good friend Shelley's Blog you are on the right track! I love Shelley :) If you are just visiting, there is a list below and you can go back to the beginning and start the hop. I am the last stop on the hop. After you are done, please make sure you go back to My Pink Stamper and play along in the challenge with us! Our challenge this month is A fresh, clean start! We are all making something that we would give to someone or make for ourselves to welcome the start of a brand new year! We are showcasing any and all My Pink Stamper Stamps tonight! To me, fresh and clean is white and crisp. I used the Sophie Cricut cartridge and cut one of the cards on it. I then cut the background layer and ran it through the Cuttlebug. To get the middle part that I stamped on, I used my Gypsy and removed the contours and just cutting the middle scalloped circle. I then used the My Pink Stamper Biggie Christmas set (yes, it is not just for Christmas) to stamp the middle of the card. You can order this set HERE. I knew it wouldn't fit the way it was, so I masked off the word's once at a time and stamped them individually. I then outlined the edge with Enamel Accents in White. For the flowers, I used the Flower Shop Cricut Cartridge and cut the basic flower at 1.5". 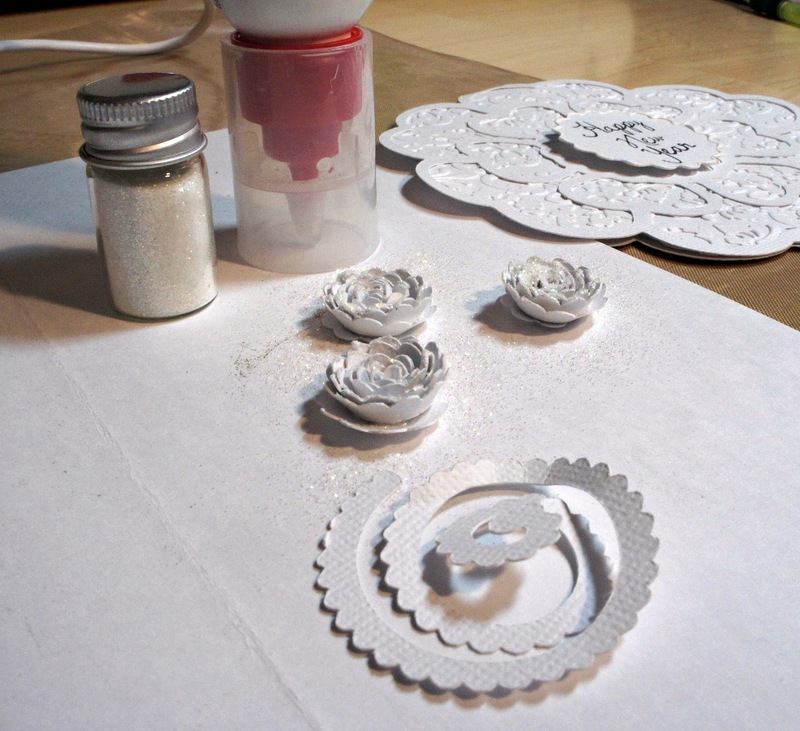 After it was put together I added some glue the the tops of the petals and sprinkled with white glitter. For the ribbon I dyed some seam binding with Glimmer Mist, bunched it all up and waiting for it to dry in a ball. After dry I tied the bow. 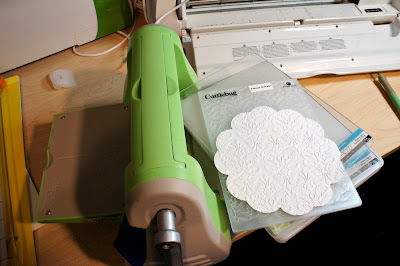 Before you go back to My Pink Stamper to play along, how about a giveaway? Just leave a comment (hopefully about my project) by Monday, January 16th at 10PM Central time. I will pick a winner with random.org and post it on Tuesday, January 17th. Please make sure you come back and see if you are the winner. You will have until Friday, January 20th to claim your prize. Sophie = card at 5.75"
Flower Shoppe = flowers @ 1.5"
Oh, this is gorgeous Maria! So elegant! Those flowers and that bow really set the whole card off!! I love how you showed each step in pictures. I think it's amazing just how good white on white looks. I've never seen the enamel used either. What a great card! This is just beautiful I like that you used just the centers of the flowers for the flowers it is so elegant. Nice seeing you again. LOVE those flowers. Your card is very elegant. Gorgeous card! Love the clean look. Thanks for the giveaway! Beautiful Maria! Your talent amazes me :) I think of white and crisp when I hear 'new' too! I love those little flowers, adorable. TFS! Great card, I like the clean white idea also. Thanks for sharing and for the giveaway. What a beautiful card! I especially like the dimension you added with the rosettes and the enamel. Thanks for the inspiration and the giveaway! VERY ELEGANT ... I want to try an all white card now!! Such a very pretty project thanks for sharing your talent with all of us! I love your card! I love how you incorporated embossing and flowers. I use both, but never with as much success! Wow! Your card is beautiful! I think your card looks fantastic. Nice and classy. Absolutely LOVE your card! Your flowers are incredible! TFS! Your card is fresh, clean and elegant! I have never used enamel accents...looks like I need to! I love the white clean look of your card. Beautiful flowers, wonderful sentiment. It all works beautifully. Great job! I love the white on white layers, it is very elegant. Beautiful card! love the white on white! Beautiful card and those flowers are stunning. What a beautiful card! Love all the detail. That is very pretty. Very elegant details. Love your elegant white card. I LOVE this card. When I first saw it, I thought it would be difficult to make. Then, you shared your "recipe" and it is so simple. Thanks for taking the fear out of a project. 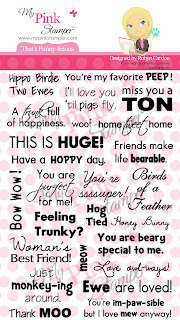 I WILL be making a card like this for a birthday. Your card is beautiful!! This hop has been so much fun. what a beautiful project. 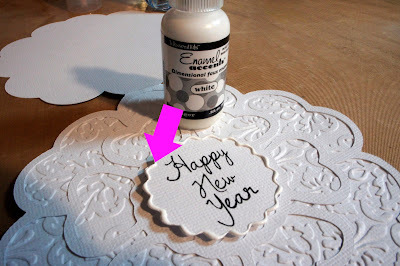 I never think of layering the same color together, but embossing one layer does bring such a fun affect to it! Thanks for sharing Maria, and thanks for all the hard work that you do for Robyn too! I always enjoy playing along with you guys. I love your card. So clean and simple. Thank you for sharing. Beautiful card. I love how you embossed the background and made the flowers. This was defiantly a challenge but I think everyone did a great job. Wow, what a gorgeous card - love the crisp, clean feel of it!! This is so pretty! I love the embossing! Beautiful card, Maria. Love the attention to detail, the glitter on the flowers, the dimensional paint around the sentiment, the hand-dyed ribbon, I could go on and on. Thanks for participating in the blog hop and for the chance to win. 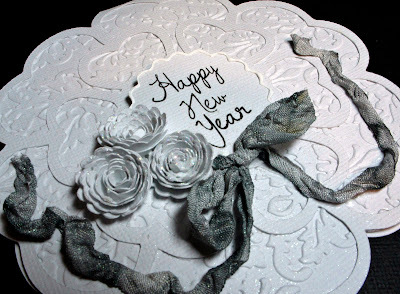 Pretty Card, love the way you masked and glittered and sprayed. This is a wonderful way to celebrate. This is such an elegant and beautiful piece. The color scheme (white and glitter) looks very good. I will be looking forward to your next blog! The idea of using the white is very symbolic as well as the glitter adds a touch of sparkle. Very eye catching. I don't have this one! I hope I am allowed to enter! LOVE that Cuttlebugging! Gorgeous! :) HUGS my friend! Like the layered look of your card. Especially like the embossing. I've been a follower of your blog. Thanks for giveaway chance. Beautiful project! Love the way you masked the stamp and used each word, one at a time. I would have never of thought of that! Thanks for sharing! Love the idea of the white, that makes me think of fresh and clean as well. Beautiful!! Love white on white. Understated and classy. Your white on white card is perfect, it is perfect representation of a new year with a fresh beginning, I love the analogy! The flowers are absolutely stunning, I just love them! I love your creations thanks so much for all of the inspiration you provide. Thanks for the opportunity to win some My Pink Stamper stamps, unfortunately I don't own any yet so this would be awesome to win! Beautiful card! I love the rosettes! Wow, that is a gorgeous card! I love all the detail. I love the card very classy! Do they fit very well in an envelope with all those flowers on the front? Wow that's an awesome card! 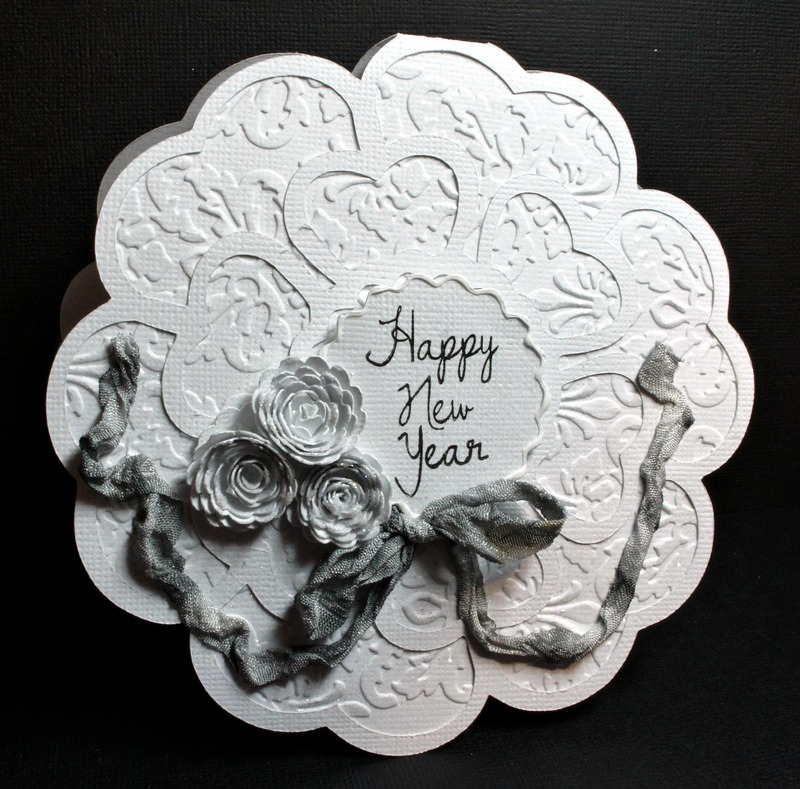 Love the crisp white card and those 3D flowers. So pretty...I really love the flowers. The embossing and cut are just beautiful. I love this card! Your use of embossing and layering it with the die cut is truly amazing. It's just a beautiful card!